I’ve been trying to think of which famously resilient historical hero I remind myself of in going back to basics with this new gansey after the relative failure of the last one—King Alfred and the cakes? Robert the Bruce and the spider? No, after mulling it over I realise that the person I have in mind is Jack Skellington from The Nightmare before Christmas who, you will recall, flirted briefly with being cuddly Santa Claus (with disastrous results) before embracing his real nature as the Pumpkin King, scary master of Halloween. Who was I kidding? After straying from the path of true wisdom with loose stitch gauges and big, floppy pullovers and other such abominations I have recanted, done my penance, and been readmitted to the congregation (after extra whippings on appeal). So I’m back in the groove with a nice, tight, 8 stitches-to-the-inch piece of knitting, stiff enough to be used as a space marine’s body armour—fisherman’s iron, reinforced with Kevlar. It’s good to be back. I thought I’d share this with you. I come across all sorts of odd little facts in my job, and here’s a factette that caught my fancy this week. We’ve got a photocopy in the archives of a letter from 1801, the time of the Napoleonic Wars (and Jonathan Strange, for lovers of BBC fantasy drama). Britain was fighting most of Continental Europe at the time, and a dozen Dutch fishermen had just been taken prisoner. The question for the Government was, what to do with them? Isn’t that great? A rare example of enlighted Government thinking—a sort of 19th century Community Service Order! Finally this week, Lynne has sent me one of the most charming uses for gansey patterning I think I’ve ever come across. Again, I won’t spoil the surprise, but you can see for yourselves by clicking here. 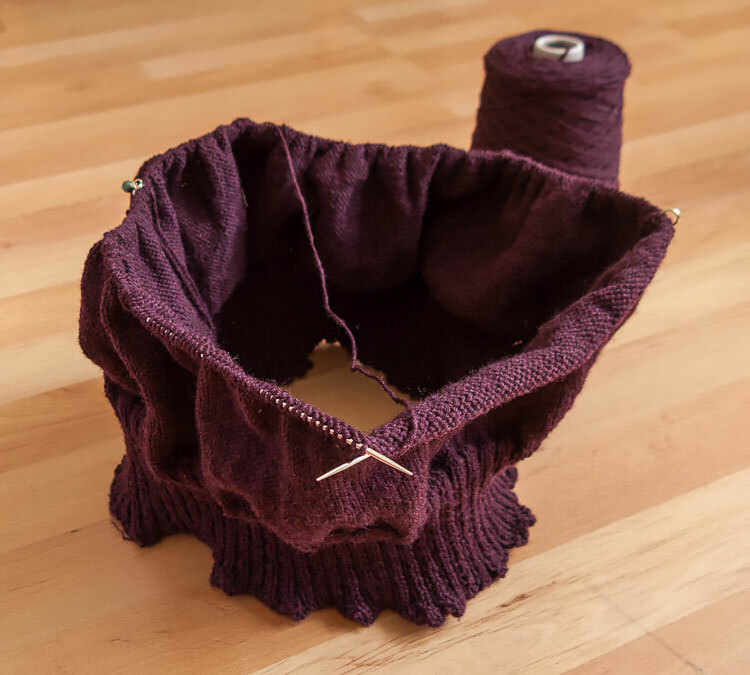 And, the ever-productive Judit has finished another splendid gansey, this time in claret – just go to the bottom of page 2. I’m sure it will turn out to be another good one Gordon. I’m wondering about copying your sea mist Matt Cammish gansey. I might just do it yet. Hi Nigel, I’m nae counting my chickens this time! As for Matt Camnish, it’s a great pattern – maybe my favourite – not difficult and would look great in almost any colour. I’d say, go for it! Many thanks for adding my Claret to readers gallery ! Gordon and what happened to Flamborough II. ? Hello Judit, you’re very welcome as always. It’s great to celebrate the sheer diversity of the gansey family, isn’t it. Flamborough II is sitting on the naughty step, thinking about what it’s done, before being recycled, like the atoms of dying stars that radiate through the universe, endlessly combining in different patterns into bodies such as ours, giving its life in an act of self-sacrifice that other gansey might live. 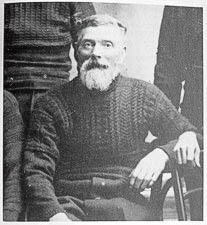 What’s not to like in a gansey that can stand up alone, with a garment like this it would be possible to be invincible! Or very nearly! It is a super colour and pattern looks good too. I always feel this whole tension thing can be a tricky business, but you look to have it totally under control. The weather is very wild and windy in the South. Next door’s peacocks and wild peasants fill the garden, all a bit spooked by the roaring wind. Take care! Gordon, I’m glad you returned to a tension that’s comfortable to you – especially if you’re knitting something for yourself. I’m also a ‘firm’ knitter, but to keep my hands from aching, I do my ganseys with a 2.50mm needle instead of the 2.25, it’s still ‘firm’ but not quite carpet stiffness. The Damson will be beautiful! Yes, I do so agree with Lynne, sorry to go on. I think the trick is to be comfortable with the physical action of the knitting, then it flows so well. All yarns “handle” differently, and sometimes we need to adjust by altering needle size. There again, sometimes nothing we do helps! I have returned to Chloe’ s vintage cardie, about time I hear the cries, but I too have a tension problem. The yarn is a 4 ply cotton, lovely and expensive, but unlike the original woolly yarn of the pattern, the stitches do not “cling” to each other. This has led to a lengthening and widening of the garment, and to my critical eye the pattern has lost its some of its delicacy. I have shortened the garment slightly, but with some trepidation, and I think it will be quite good. It just goes to show, the best laid plans of mice and men! Regarding the gauge problem with the gansey – as I’ve heard, it’s called ‘knitting’, not ‘making sweaters. Have pulled out several of my own for similar problems. Keep up the good work, your creations are spectacular! About the stitch gauge thing. What happened in my case was probably inevitable, but it wasn’t exactly the case of the yips it might appear—more a sort of late-life crisis. You must remember, apart from one Lopi jumper last Christmas, I’ve only ever knit ganseys. My stitch gauge has always been very tight, over 9 stitches to the inch. 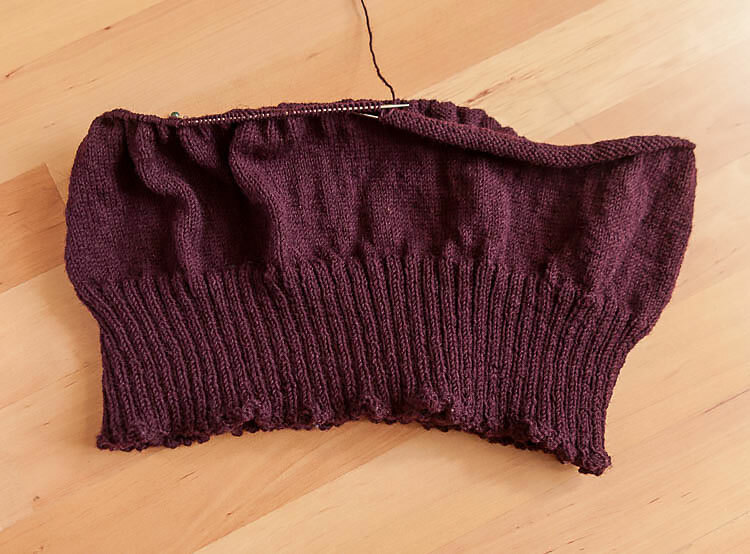 Now I reached a point this last year when I had the urge to experiment a little; and bearing in mind that my jumpers have always been so stiff the crack if I flex my elbow, I wanted to try a looser stitch gauge to get a softer, more drapey sort of garment. I aimed for 8 stitches an inch, but of course it’s quite hard to judge a thing like that. 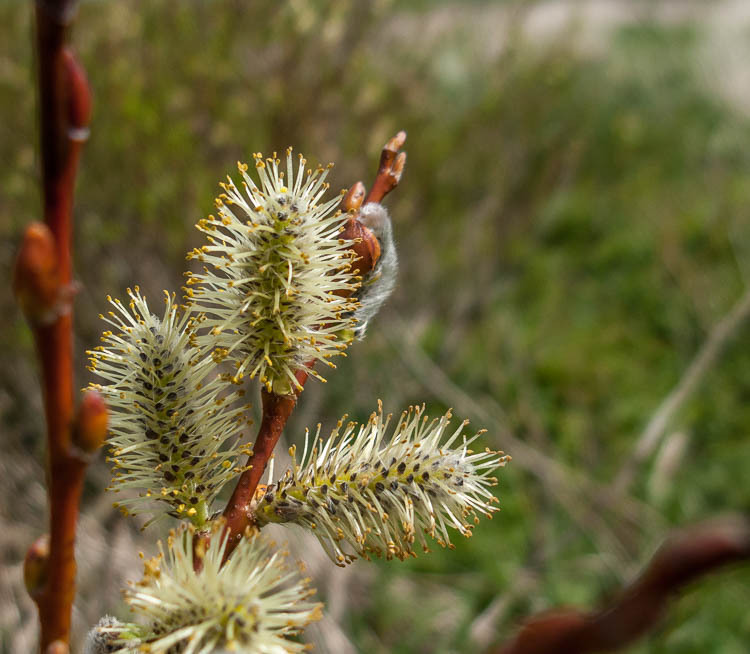 Once I relaxed my tension, it just kept on going, like a gourmand who can’t stop at just one piece of cheesecake; until it was less than 7 stitches to the inch and I found I was knitting colourful army tents.